March 1951. 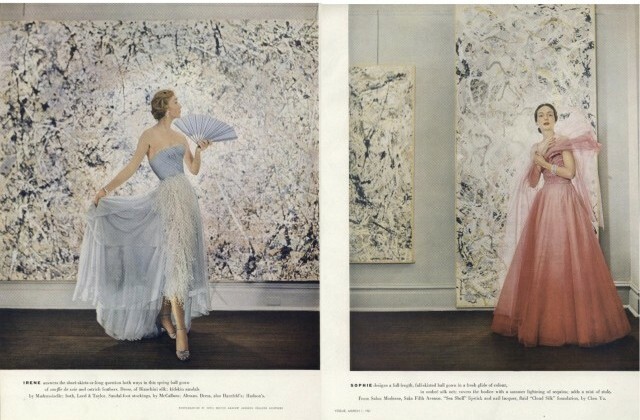 A three-page spread on Jackson Pollock was published in Vogue titled American Fashion: The New Soft Look. Sir Cecil Beaton, one of the most praised British portrait photographers ever, had taken the photos in which Pollock’s radical and dazzling Action Paintings served as decorative backgrounds for models who wore haute couture by Irene and Henri Bendel. Under the artistic direction of Alexander Liberman, Vogue became an important showcase for modern art. The philosophy behind this art movement was a mystery to many and needed to have a widespread international podium. It was one of these photos that created my passion for the relationship between art and fashion (and vice versa). Cecil Beaton, The New Soft Look © 1951 by The Condé Nast Publications. The photos Vogue had published represent the tension between the masculine and intensive character of Pollock’s paintings and on the other hand the soft and feminine nature of the fashion models. The elegant and stylized manner in which Beaton took the photos also comes into play. It is easy to see why these images have come to haunt contemporary studies of Pollock’s work: their elegant composition brings into juxtaposition a set of polar categories that have been used to talk about art throughout the modern period: avant-garde and fashion, abstraction and representation, autonomy and decoration, painting and photography, production and consumption, masculinity and feminity, art and commerce. […] As a group they structure the field of discourse concerning the making and receiving of modern art. 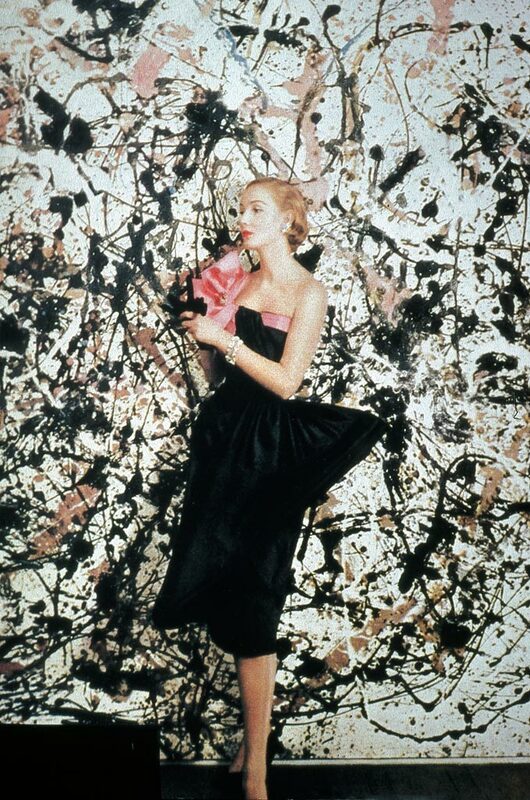 The New Soft Look, photographed by Cecil Beaton against Jackson Pollock Paintings. © Condé Nast via moon-palace.tumblr.com. Betty Parson of the Betty Parson Gallery in New York was thé early adapter of the in New York developed art movement Abstract Expressionism in the 1940’s. It was the first American art movement which dethroned Paris as the center of the Western art world. In the 1950’s Europe was recovering from its war wounds and the art world relocated to the world of freedom and rawness: New York. At her gallery on 57th Street Parson held groundbreaking shows from the most famous American Abstract artists of that time: Ellsworth Kelly, Mark Rothko, Robert Rauschenberg and Barnett Newman. Plus, she was the only dealer who wanted to represent Jackson Pollock together with his powerful Action Paintings. During his solo exhibition in 1950, which was widely praised by the leading art magazine Art News, he showed 32 paintings including Autumn Rhythm (1950), Lavender Mist (1950) and Number 27 (1950). These were the paintings Cecil Beaton used for one of his (in my opinion) most interesting fashion photo shoots in his Vogue career: The New Soft Look. 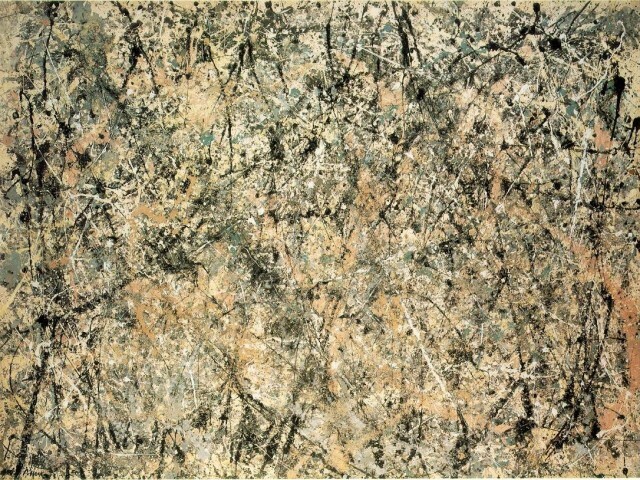 As a rejection of all traditional art techniques, Jackson Pollock preferred to place his extremely large canvases on the floor and pour house paint directly onto them. He just used a stick and threw lines of paint in the air that landed on the canvas in their own way. Action Painting was born. This manner of painting in which the artist dripped the paint straight on a canvas without the use of any brush, easel or other tools has its roots in the works of the German surrealist Max Ernst. […] It seems to me that the modern painter cannot express this age, the airplane, the atom bomb, the radio, in the old form of the Renaissance or of any other past culture. Each age finds its own technique. The abstract image was a representation of the subconscious mind of the artist. The formative principles were elevated by a combination of the so-called ‘physical automatism’ and a major (surrealistic) factor of coincidence. This physical involvement with the act of painting determined the visual appearance of the works of art. In art, this has never been the case before. The free manner in which Pollock painted has had an enormous impact on the contemporary art and even fashion designers get inspired by him up to the present day.